If you are interested to know how our products and business-to-be is progressing, please join our mailing list! Hello! We are the Chua siblings, and our Mama's on a mission. 蔡海莉 Hǎilee Chua (pictured in red below with Mama Chua) is the screen name of the elder sister, and 蔡海德 Hǎidé Chua, is the screen name of the younger brother. They are both fourth generation overseas born Han Chinese, living in New York. Hǎilee was rejecting her Chinese identity when she was 2 years old. Mama Chua thus began a mission to encourage and reinforce a healthy ethnic identity for her kids. This included moving to an apartment nearer to Chinatown and Shuang Wen School (a Chinese-English dual language public school)... and the exploration of Hanfu (Han Chinese Clothing) as a vehicle towards the expansion of Han Chinese cultural activities in their lives. 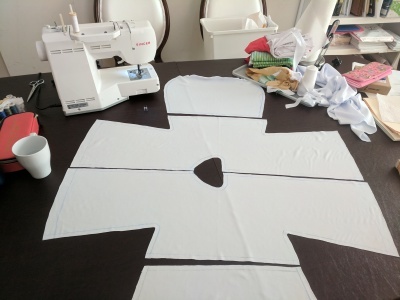 Mama Chua started sewing Hanfu for her children, and realized there is a great need for Han Chinese people to be aware of their sartorial inheritance, and to introduce it to children from young. 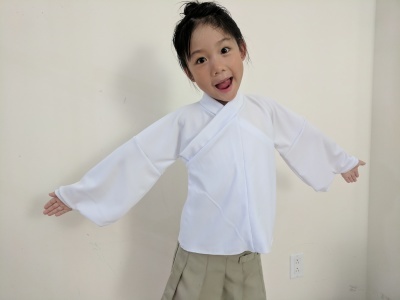 For now, Little Han will casually feature Hǎilee and Hǎidé in a general manner, and one day, littlehan.com will make Hanfu, and Hanfu-inspired contemporary clothing commercially available to you. This is something that is never-been-seen-before in the Hanfu market, an original innovation, and I believe it will be ​A HIT in today's modern world. A sports T-shirt, modeled after centuries-old Hanfu with all the correct seams. ​Seriously, It looks better in real life. For my debut in future, I intend to offer 3 types of sleeves. Choice of black or white. HELP! I NEED TO KNOW! 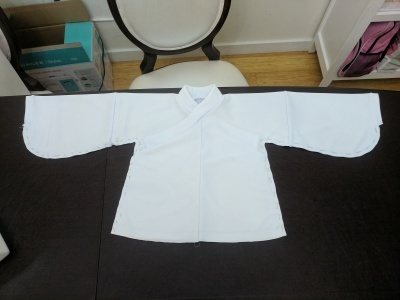 How likely you are to buy a Hanfu T-shirt for yourself? For a child? Feel free to send us a private comment here.